A Thru Dropbox is assigned to each Thru user account that has been enabled with a HOME folder. Follow these instructions to use Thru Dropbox™. Type the Thru user’s email address in the To: field. This is the email address of the person that has a user account in Thru and to whom files need to be uploaded. This is the email address of the person uploading the files and will be used to send upload confirmation notifications. Subject and Message are optional fields but highly recommended to share the reason the files are being uploaded. 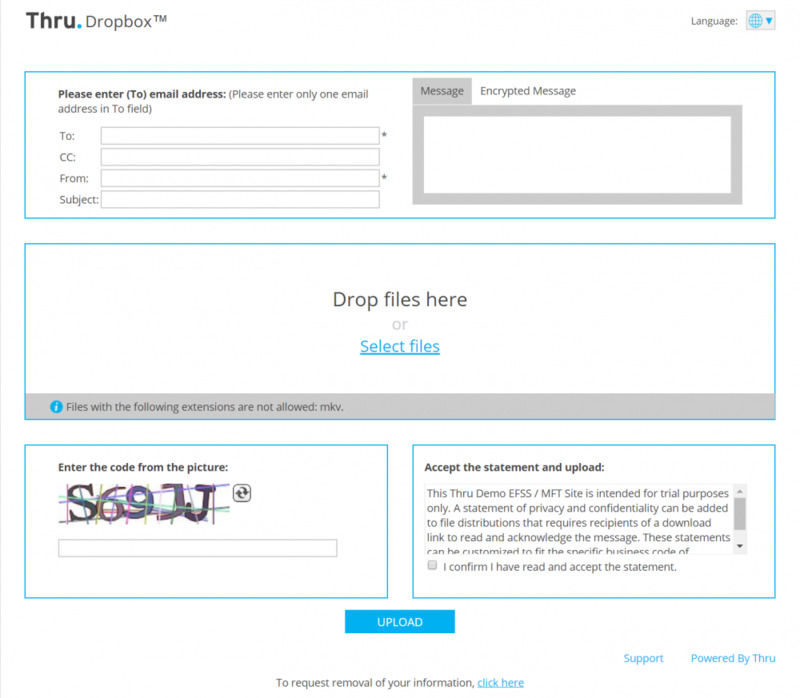 Select the files that you would like to upload to the recipient’s Thru Dropbox. The sender has multiple upload options that are explained in earlier sections of this User Guide. The Browser Upload method is the most used method and allows files to either be selected using the drag and drop capability or manually. If using Java file are selected by clicking ‘Add’ or ‘Select Files’. Files can be removed from the upload list by clicking either ‘Delete’ or ‘Remove’ depending on the upload method. After files are selected, the sender must enter a CAPTCHA code and accept the confidentiality statement to complete the upload process. Once all information has been completed, Click Upload. Upon successful upload, a confirmation message will be displayed.